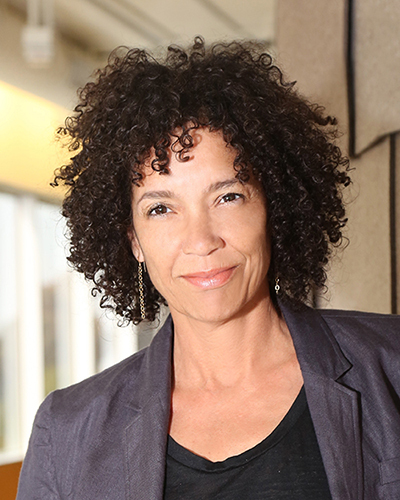 Stephanie Allain is a rare gem in the film industry. Not only is she brilliant and successful, but as an African-American woman who got her start over 25 years ago in a notoriously and overwhelmingly white and male-dominated business, she has charged ahead to break open established perceptions. As an independent film producer, Allain has her own production company and has served as the director of the LA Film Festival, transforming it into the most diverse film festival in the world. She’s also a board member of Women in Film, a founding member of ReFrame, and is a member of the Academy of Motion Pictures Arts and Sciences, Writers Guild of America, Producers Guild of America, and the Dramatists Guild of America. Spending her childhood in both New Orleans, where she was born and visited every summer, and in Los Angeles, where she was raised and attended school, gave her a unique perspective on various cultures. Allain attended St. Mary’s Academy, a college prep high school in Inglewood where she excelled in literature and creative writing. When it came time to think about college, staying in LA and attending the University of Southern California (USC) seemed like the best choice. But after a couple of years, she got restless, left school, travelled to Hawaii, then moved to Madrid, all the while trying to find a place where she really belonged and could grow. While still at UCSC, Allain continued to study dance and writing and was encouraged by her dance teacher, Donald Byrd, to apply to CalArts for grad school to continue her dance studies. She found herself torn between academia and the arts. Allain started to really reflect on what she was good at and what she liked to do. Being naturally analytical, she carefully weighed her abilities and passions and heard about a job in the entertainment industry called a “reader”, thinking that getting paid to read would be the perfect career choice for her. And she persisted. From there, Allain landed a position as a story analyst at 20th Century Fox, making fortuitous connections that would propel her rise within the industry. One of those key contacts was VP Amy Pascal who was so impressed with Allain’s writing, that she asked her to be her personal reader. When Pascal moved over to Columbia Pictures, Allain joined her there and ultimately was promoted from the story department to join the executive ranks. In the process of becoming a creative executive, she also needed to find a replacement for her former position and was determined to find a person of color to fulfill that role. One of the applicants was a senior at USC School of Cinematic Arts who seemed much more interested in talking to her about his screenplay than interviewing for the job. His name was John Singleton and his screenplay, entitled Boyz N the Hood, centered around three African-American male friends growing up in South Central LA with violence and crime enmeshed in their everyday lives. Singleton’s story was not the kind of subject matter that Hollywood typically embraced, especially in 1990, but Allain zeroed in on its brilliance and importance. She was determined to not only get it made but to have Singleton direct. “Boyz N the Hood set the tone for my career,” says Allain. The film was also her debut as a production executive, requiring her to learn the intricacies of making a movie from the ground up. All of her hard work and dedication definitely paid off. Starring Cuba Gooding, Jr., Ice Cube, and Laurence Fishburne, Boyz N the Hood garnered Academy Award nominations of Best Original Screenplay and Best Director for Singleton, who was only 24 years old at the time and was the youngest person ever nominated for Best Director, and the very first African-American to be nominated in that category. This landmark film was selected to be preserved in the National Film Registry for its cultural significance - a rare and distinguished honor - only 25 films are chosen each year. She started to rethink where she wanted to go. It had been ten years since she had her first child, and another baby was on the way. It was time for a change. “I looked for another job and I didn’t have to look far because the studio made a deal with Jim Henson Pictures and they asked me to run it.” Thinking that Henson would allow her to bring together her professional and personal life by making family movies, Allain eagerly took the job. She took time off to reconnect with her two sons, one of whom was a budding performer. 3 Arts approached her to be their in-house producer and she took the job wary that management wasn’t really her thing. While there she came across a stirring and thoughtful script by a young, relatively inexperienced writer/director named Craig Brewer, called Hustle & Flow and knew the film deserved to be made. Not only did it have a black cast, but it flipped the glorified stereotype of a pimp, showing that even the lowest of the low could be elevated through artistic expression – specifically music. She also called her friend John Singleton to tell him about the project and he ended up financing the entire film. Yet again, Allain recognized the potential of an outstanding screenplay and turned it into an outstanding film. Together she and Singleton produced the film and Brewer directed it. Hustle & Flow was not only a huge commercial success but its lead actor, Terrence Howard, was nominated for an Academy Award for Best Actor and the film’s song, It’s Hard Out Here for a Pimp by Cedric Coleman and Three 6 Mafia, won an Academy Award for Best Original Song. Three 6 Mafia was the first hip-hop group to ever perform at the Oscars and win the Oscar in that category. Allain views the onslaught of digital formats as a means for up and coming filmmakers to get their work out in the world without needing to seek permission via big studios. She’s at a stage in her life where she’s seeing the people that she mentored start to mentor the next generation, and she’s excited about platforms such as Netflix and Amazon that are making it easier for all kinds of content to get produced. "We're a company of all-black females..."
Homegrown Pictures produced Something New, Black Snake Moan, Hurricane Season, Beyond the Lights, Peeples, Dear White People, Burning Sands, French Dirty and more. "Distinguish yourself by your work and your passion..."
Allain admits that what she does is hard work and can be a hustle…up one day and down the next. But because she absolutely loves what she does, it’s a risk worth taking, and she feels blessed that she can be creative every day, reading stories, going to casting meetings, sitting with directors and choosing projects she’s enthusiastic about. Allain attributes her early success to being willing to work hard – to take scripts home with her on the weekends and read through a stack so that she was fully prepared on Monday to discuss them. She also read everything else she could get her hands on, from newspapers to novels, to get an informed look at the world and give her a wider context for her work. In spite of all of the hard work, she also appreciates having a personal life and realizes how that has contributed to her overall success. “It’s very important because it gives you a well of emotion and experience to draw from. Having kids in this business has been invaluable to me just as a human being. On May 1, 2018, Allain returned to the UCSC campus as one of the key speakers during the Arts Dean’s Lecture Series on Creative Entrepreneurship developed by Dean Susan Solt. The series featured a distinguished roster of arts practitioners, creative, educators, and advocates who provided illuminating insights, practical tools, and personal stories on how to shape an artistic or arts-related career in the 21st century. Allain’s inspiring talk, entitled From Employee to Employer, gave students a valuable insider’s look into what it takes to start out in the professional world and turn your dream job into a gratifying, lifelong career.